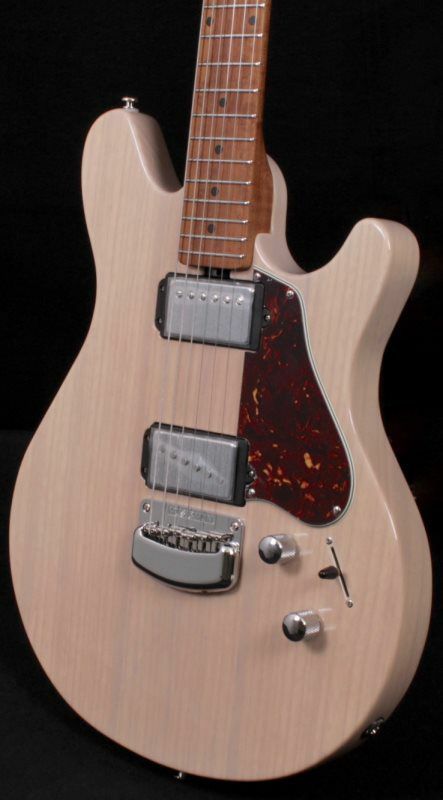 The Axis guitar features a beautiful quilt or flame book matched maple top over a lightweight basswood body. 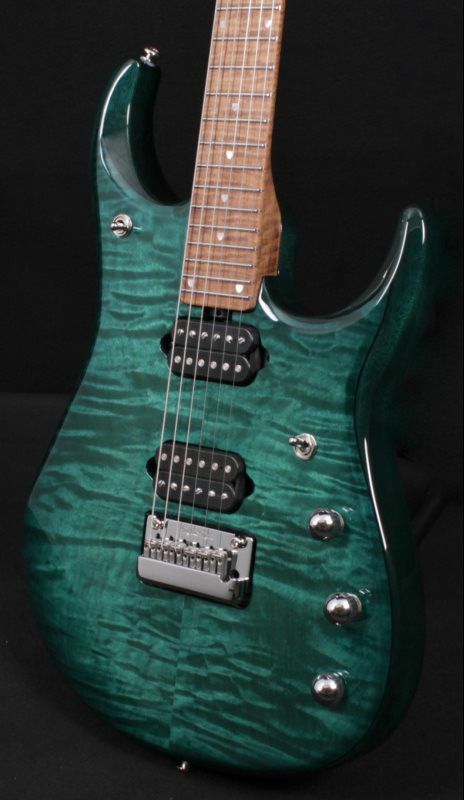 Two medium output custom DiMarzio humbuckers are mounted directly to the body for optimum resonance and signal response. This tonewood / pickup combination is a perfect recipe for hard edge rock tones, but also delivers a subtle dynamic response at lower volume levels when needed. The Axis asymmetric hard rock maple neck allows for comfortable hand positions across all 22 frets, while the double locking Music Man Floyd Rose tremolo keeps the guitar perfectly in tune. The 2018 Cutlass RS HSS features a brand new roasted figured maple neck with rosewood or maple fingerboard (fingerboard option depends on body color). The RS HSS model retains all of the familiar elements of the original Cutlass including an alder body, super smooth modern tremolo and oversized 4 over 2 headstock. 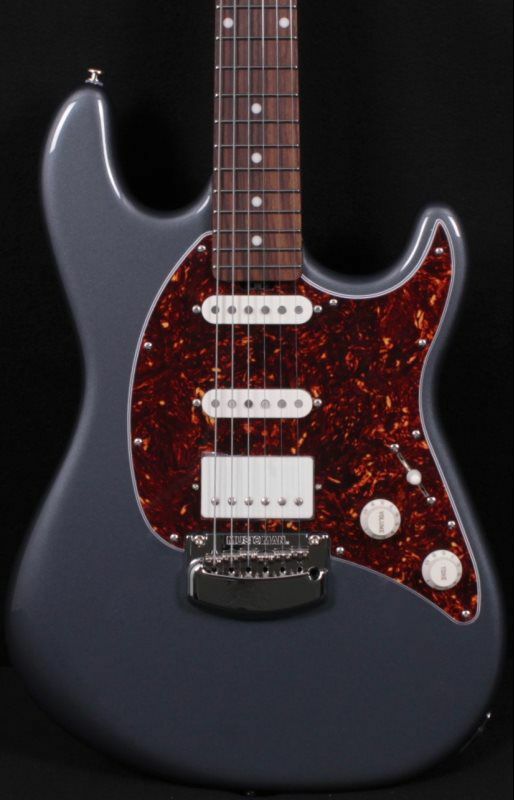 The bridge pickup in the HSS is a custom wound Music Man ceramic humbucker with a vintage sound that compliments the single coils yet has plenty of crunchy rhythms and biting lead tones. Also new for 2018 are two new finish options - Firemist Silver with maple fretboard and Stealth Black with ebony fretboard and matte black finished maple neck. 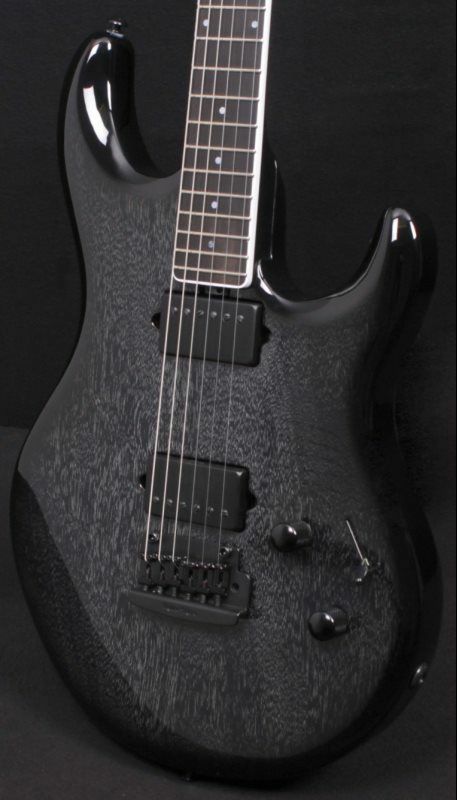 Just in - Killer JP15, this guitar has perfect balance, the tone is exceptional, the playability second to none - its pretty much a perfectly built guitar. If your a Petrucci fan it doesn’t get much better, even if your not, you will be hard pressed to find a better all around guitar!! Weight - 7 lbs. 9 oz. 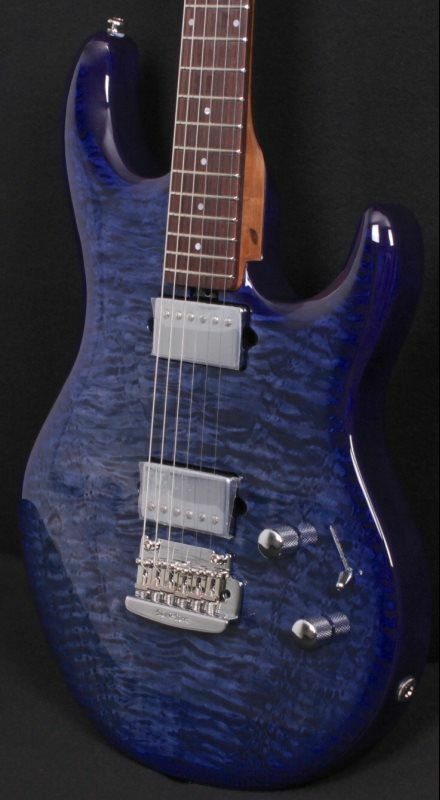 Bridge - Custom John Petrucci Music Man® Piezo floating tremolo, made of chrome plated, hardened steel with stainless steel saddles. Weight - 8 lbs. 4 oz. The Monarchy Series Majesty is constructed with a through-neck design of mahogany and flame maple top; available in 4 rich translucent finishes. 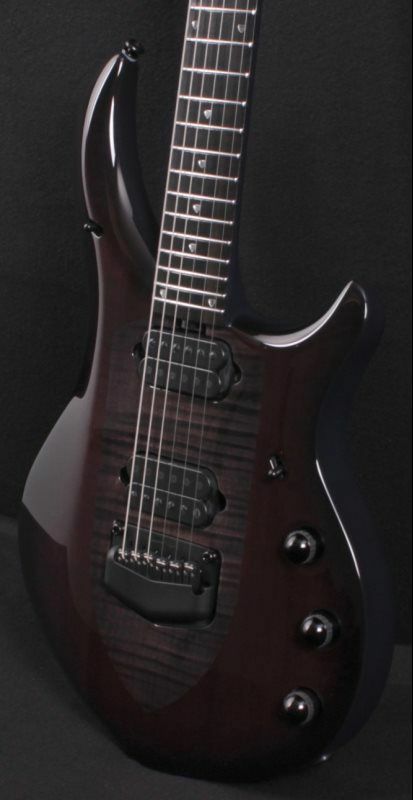 The Monarchy Series Majesty comes with chrome or black hardware featuring a custom John Petrucci Music Man® Piezo floating tremolo bridge and Schaller locking tuners. Weight - 6 lbs. 15 oz. The new Luke III Ball Family Reserve is the next evolution in the design process started with the original Luke model. 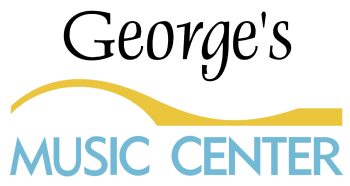 Addressing Steve’s performance needs as a touring guitarist has been critical in the development of this new edition. 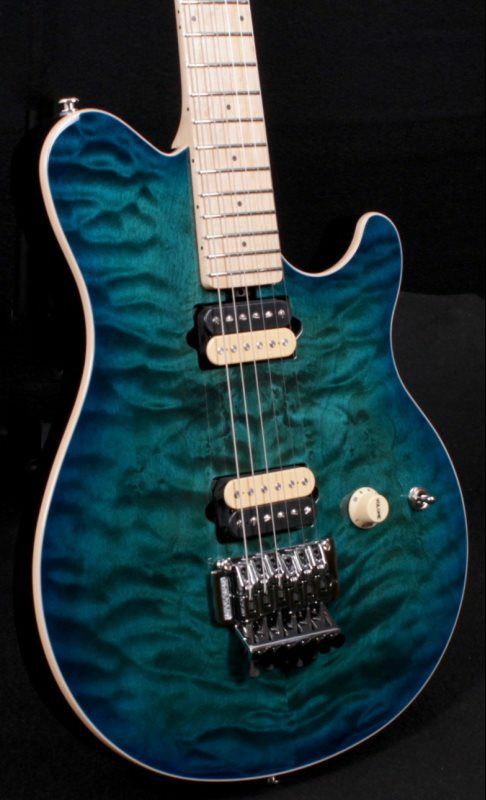 Available in new Tumescent finish, and signed by Steve Lukather himself. Limited to 300 instruments worldwide! The new Luke III Ball Family Reserve is the next evolution in the design process started with the original Luke model some 22 years prior. Addressing Steve’s performance needs as a touring guitarist has been critical in the development of this new edition. The added mahogany tone block, on-board 20db boost, beautifully figured A++ maple top and roasted birdseye maple neck have refined this new signature edition into an instrument of superior tone and versatility. This has just arrived from Music Man. It exceeded our expectations. 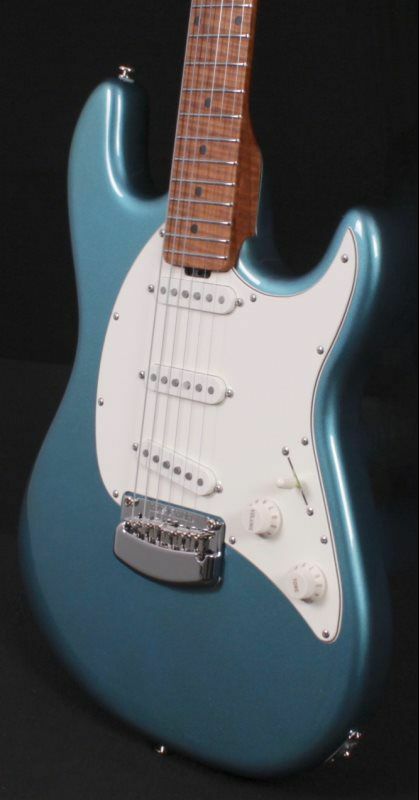 The tone is so organic, it goes from all out rocker to complex jazz tones to a spanky Tele tone - it has a very wide range of tones, this with the infamous Music Man playability - Makes for a great experience!! Weight - 7 lbs. 5 oz.